While cleaning out my kitchen cabinets I found an old sifter. I use flour from time to time but “sifter” is no longer part of my baking vocabulary. It was about to go in the donation bag when a word from my high school French popped into my head. Fleur. 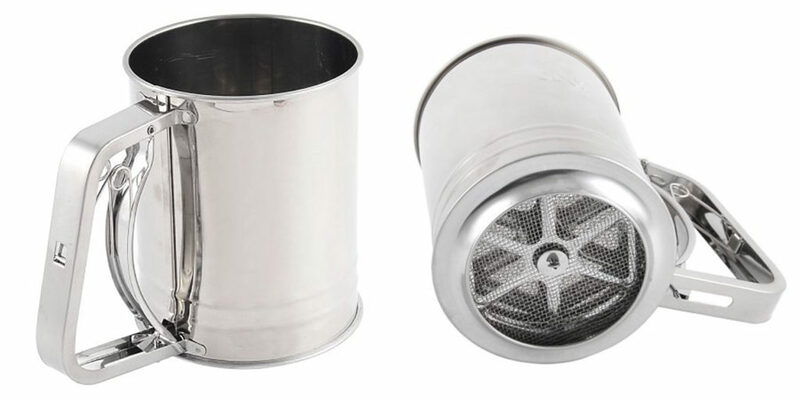 The sifter was saved. With my new “repurpose it” eyes, I saw it as a flower pot with built-in drainage. I painted the sifter with two coats of leftover Antoinette from my high chair project. The color matched one of two lonely saucers I owned. If your sifter is new, remove the label. You can soak it in sudsy water and scrub it off. Goo Gone works well on stubborn glue. I didn’t paint the inside of the sifter all the way down because I knew it wouldn’t show. I cut a two circles of coco liner in the bottom. Coco liner is the stuff you see on hanging flower baskets. The circles don’t have to be exact. Squish in the coco liner in the bottom. It absorbs the water, keeps the soil moist, and prevents overflow when watering. Fill with soil and a plant — preferably a flowering plant to keep the pun intact. If you’re thumb is as brown as mine, you can create an artificial flower arrangement instead. I’m sure you’re dying to know how I decorated the pink sifter. I love to play with words. 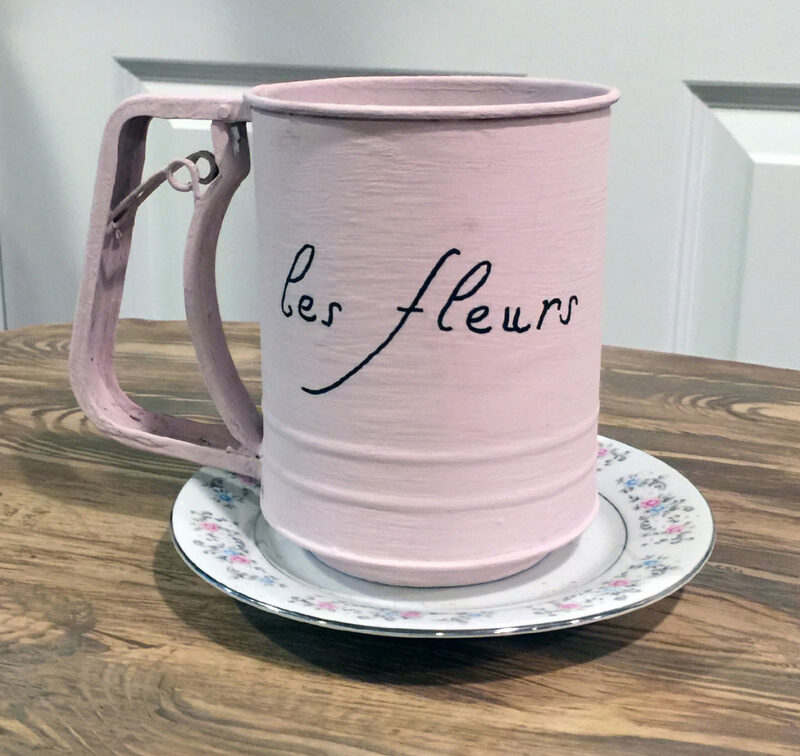 The French word, “fleur” is close to the English word, “flour.” And what is my sifter for? 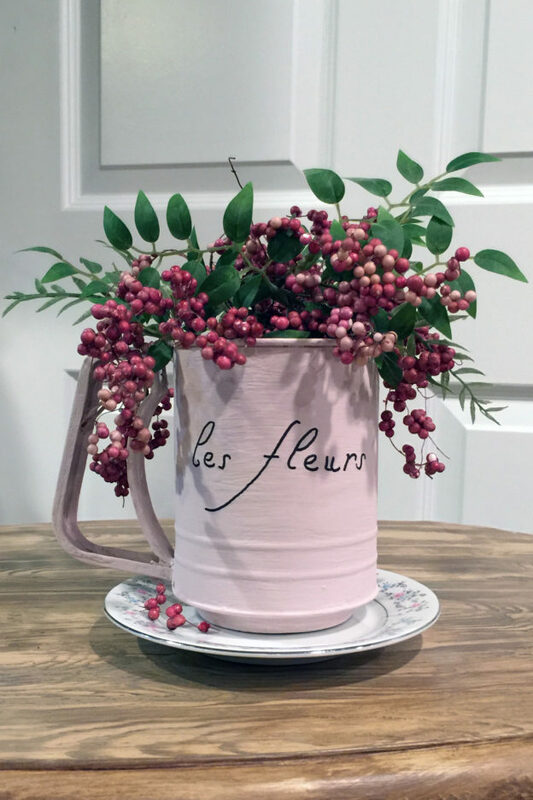 Flowers, which in French is “fleur” Flour. Fleur. Flower. Get it? I crack myself up. 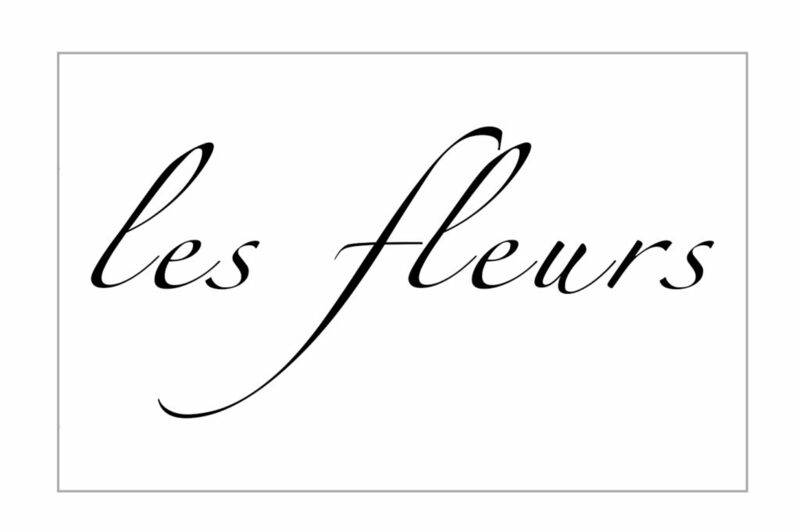 A single flower is “la fleur” and a bunch of them is “les fleurs.” You can download the lettering I used here. I used the tried and true method of rubbing pencil on the back, flipping it over and using the point of the pencil to transfer the lettering. The rectangle outline helped me position the the transfer. I knew I would cover the transfer with a dark paint pen so using a pencil transfer was not a problem. No need to wax or varnish. Voila! This is an artificial flower arrangement but I’m inspired to replace it with soil and a real growing plant. 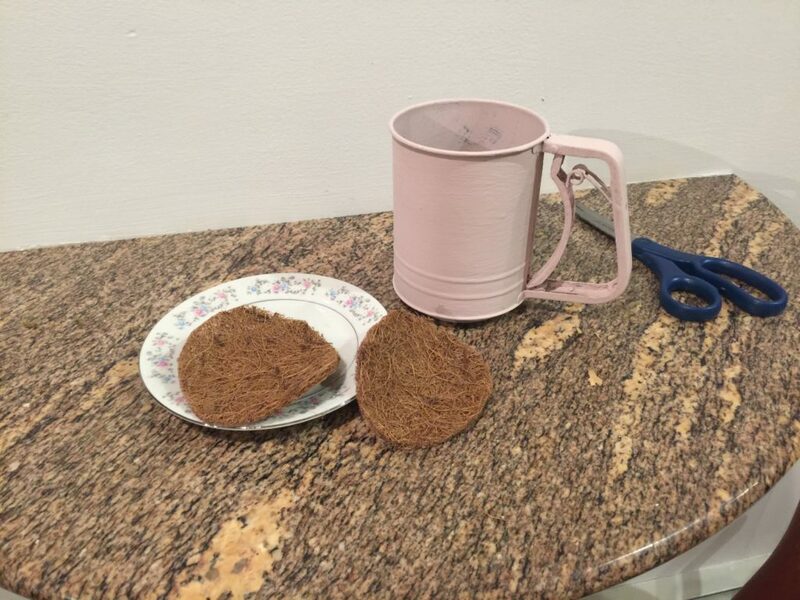 Look at odd items with an eye to repurpose. Play with words. It’s fun. This entry was posted in Furniture, Musings and tagged Annie Sloan, Antoinette, chalk paint, chanukah, christmas, craft, crafting, fleur, flour, flower, flower pot, furniture, gifts, hanukkah, holiday, Karen Rae Levine, paint, painting, planter, refinish, refinishing, refurbish, refurbishing, repurpose, REPURPOSING. 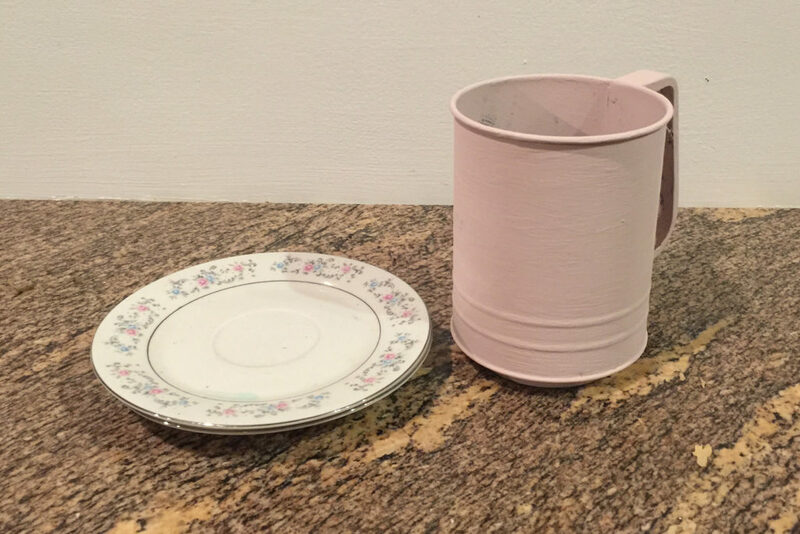 STAIN, saucer, sifter, staining, Suite Pieces on December 2, 2016 by Karen Levine.